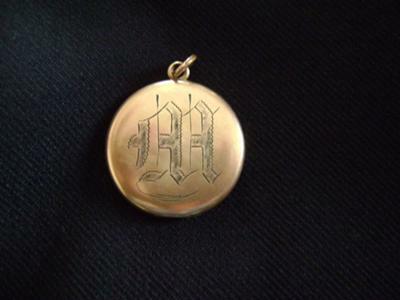 This is a locket that belonged to a family member. Someone told me it was given to gold star mothers. It has an "M" on the front and the back has a star to the left with a stone in it and to the right is a moon with all stones in that, too. Simon's Reply: Susan, this is an interesting piece of jewelry. It doesn't seem to be overtly Masonic, though. 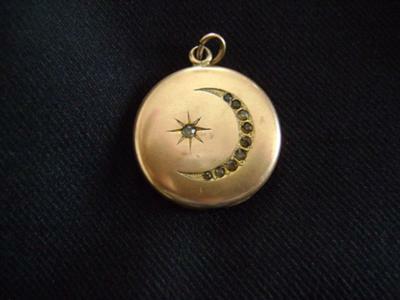 If someone has another one like it, perhaps they can help you to identify this Moon locket with its engraved "M" on its reverse side. I have a locket that looks exactly like this one. Mine doesn't have anything inscribed on the very back, though. I bought it about a year ago from an antique store for 5 bucks. I didn't even know it was a locket until my grandfather pointed it out. When we opened it, there is a black and white picture of a man with a cigarette. I recently did some research after looking behind the picture, there is a W&H Co engraved inside a heart. Turns out that the company, Wightman & Hough Company, made sweetheart lockets between 1856 and 1922 in Providence, Rhode Island. My locket belonged to my grandmother. There are no markings, but the side with the moon and star are identical to the one pictured. My grandmother lived in York, PA. I'm not sure if she got it new or if it was passed to her by her mother. Try the Odd Fellows. (Independent Order of Odd Fellows). I have seen these exact symbols in the Odd Fellows cemetery in Ennis, TX. Good Luck. I also have a Moon Locket, left in my grandfather's things. It has an "A" on the back. Inside, under the gold-ringed photo glass, is stamped FMCO. I thought Masons, too, because my grandfather was a Shriner, my dad was a Mason, my grandmother & mother were in OES. I got on this site because I wanted to know more about it before taking it to my jeweler tomorrow.